The material herein is reproduced with permission of the Infrared Equipment Division of the Industrial Heating Equipment Association from the "Infrared Process Heating Handbook for Industrial Applications," Copyright c 2005. All rights reserved. To purchase a copy of the of the IR Handbook, visit the IHEA website: www.ihea.org and click on BOOKSTORE. Conduction heating is the transfer of heat by physical contact between a heat source and the object to be heated. Radiation heating is the transfer of heat using invisible electromagnetic waves of energy from a heat source to the object to be heated. Infrared is one of several ways to accomplish radiation heating along with ultraviolet, microwave, radio frequency, and induction. This handbook is only concerned with infrared heating and therefore we will use the terms radiant and infrared interchangeably. One of the first forms of heat transfer each of us encounter is radiant. The sun beam that warms us is radiant heat.. Radiant energy is not absorbed by air and does not actually become heat until an object absorbs it. While radiant energy does generally show up as heat, this is because it vibrates and rotates the atoms in the absorbing object, which results in a rise in the temperature of that object. However, radiant energy may also show up as a chemical change in the absorbing object (polymerization) or evaporation of water or solvents (drying). How is Infrared Radiation Produced? Every object with a temperature above absolute zero emits infrared energy. This is because there exists in every object a measured amount of heat, so each object has the ability to radiate heat from itself. The object that radiates heat is called the emitting source, and the object to which it radiates heat, having a lesser amount of heat content, is called the target. There are several physical laws that explain the properties of infrared radiation. The Stefan-Boltzman law of radiation states that as the temperature of a heat source is increased, the radiant output increases to the fourth power of its temperature. The conduction and convection components increase only in direct proportion with the temperature change. In other words, as the temperature of a heat source is increased, a much greater percentage of the total energy output is converted into radiant energy. For the purpose of this handbook, we will address only those sources of infrared heat used in industrial heating applications. This generally means looking at emitting source temperatures in a range from 500 degrees Fahrenheit to 4,200 degrees Fahrenheit. (These temperatures are not to be confused with oven set point temperatures or any other temperature requirements related to your product or process). As the emitting source temperature moves from 500 degrees to 4,200 degrees, the radiant output increases with a corresponding increase in peak wavelength. At each temperature point, there is a unique set of wavelength characteristics and peak wavelengths. An additional set of physical laws helps us to understand this relationship. By applying Planck’s Law and Wien’s Law, it is possible to calculate both the distribution of wavelength (spectral distribution) and the peak wavelengths of a given emitter, operating at a given temperature. 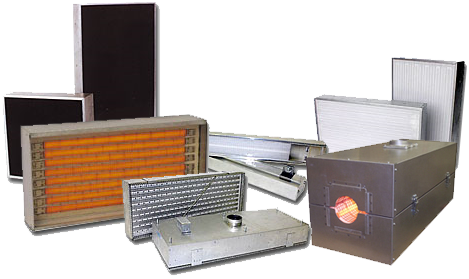 Infrared heating is the transfer of thermal energy in the form of electromagnetic waves. It is related to visible light and other forms of electromagnetic energy shown in the electromagnetic spectrum below. The infrared portion of this spectrum has been expanded to show that we can further divide infrared into long wave, medium wave and short wave. The electromagnetic spectrum describes the various types of electromagnetic energy based on wavelength. By describing an infrared emitter as long wave, medium wave, or short wave, one can quickly determine the approximate temperature range an emitter is operating, as well as an approximate wavelength range measured in microns. Since the temperature of a source determines the wavelength characteristics of that source, the peak wavelength of a given emitter can be controlled only by changing the temperature of the emitter. All emitters can be adjusted for wavelength simply by adjusting their temperatures. However, not all emitters are designed to attain the complete spectrum of long, medium, and short wavelength. There are some heat processing applications that are rather forgiving and will work with long, medium, or short wavelength infrared. On the other hand there are applications where it’s important to choose an emitter so that its wavelength distribution and peak wavelength match the absorptive, reflective and transmission characteristics of the coating or substrate. In these processes, choosing the right wavelength can make a tremendous difference in the overall efficiency and speed of the process, and may even determine whether or not the process works. There are many factors that determine whether a substrate or coating has the ability to heat up when infrared energy is applied. First, understand that infrared energy is absorbed, reflected or transmitted. For an object to be heated by infrared, some portion of the infrared energy from the emitting source must be absorbed. Once the energy is absorbed, the heat generated at the surface travels into the material by conduction. The factors that describe the behavior of infrared are referred to as Spectral Characteristics. They explain to what degree infrared is reflected or absorbed in different materials. For all heating applications, matching the infrared output with the absorption spectrum will produce a heating process that is effective as well as energy efficient. The relationship between reflectivity and absorption is called emissivity. An emissivity scale with a numeric value from 0 to 1 has already been developed for all materials. A perfect absorber of infrared will have an emissivity value of 1 and is called a black body absorber. On the other end of the scale, a perfect reflector of infrared will have an emissivity value of 0. Although emissivity can vary with thickness, temperature, and wavelength, emissivity is generally approximated with a constant value. You can find this value for many common materials in emissivity tables found in many engineering handbooks. A short list of emissivity values for some of the more common materials used in industrial processes is provided in the table to the right. Another consideration for infrared applications is color sensitivity, which describes the role color has in determining the absorption and reflectivity of infrared. This can be a concern with highly reflective colors such as silver or chrome, and must be considered with some white and yellow colors since they tend to discolor if overheated. Color sensitivity is more pronounced with higher emitter temperatures. For this reason, shortwave emitters are the most color sensitive and long wavelength emitters are the least color sensitive. In many industrial processes, the color sensitivity with medium and long wavelength emitters produces such a small change in temperature that it is negligible. Variations in absorption can even be different for the same color depending on whether the finish is gloss, satin, or flat. When applying infrared heat, give consideration to color as well as surface characteristics of the material. For best results, a range of heater temperatures should be tested to obtain the best absorption characteristics on suspect colors. Does Infrared need line of sight to cure or heat products? Typically infrared does need line of sight to cure or heat products, but if you incorporate the right heaters and proper heater configuration along with proper control you can overcome this obstacle. A reputable infrared company should be able to tell you through experience or testing if your part can be heated. What is the best way to control infrared? The heating process, type of heaters used and part typically dictates what type of control system should be used. The control of the heaters can be done using simple temperature controllers to full PLC control. Additionally you can use thermocouples in the heaters or non-contact thermocouples for very precise control. We strongly recommend utilizing SCR power control or linear voltage flow to the heaters. Are infrared ovens less expensive to operate than convection? There are many variables that determine if your infrared oven will cost less to operate. In most cases if the proper heaters along with proper oven design are incorporated into your heating process you will save money. Most Infrared companies have experiences working with utility companies and should be able to estimate your operating costs. Is one wavelength of infrared better than the other for specific products? All products have a specific heat range that they absorb heat at and depending on the type of product, material, coating and process speed of your product or coating may be necessary to see which type of heat source works best. In perhaps 95% of all applications medium-wave length heaters are best utilized. What are the different infrared wavelengths? The short answer to this is short-wave, medium-wave, and long-wave, but if you refer to our Infrared basics section on our website it does a very good job of explaining infrared as it relates to the electromagnetic spectrum. Please keep in mind that at given wave-length you have a fixed temperature. Wave-length equals temperature. How can I tell if I have medium-wave or short-wave heaters? The quickest way to tell which you have is by looking at the color your heater is emitting. From a safe distance view your heater and if it is a dull to bright orange color then it is probably medium-wave but could also be long-wave. If your heater (which is typically a quartz tube) is bright white then it is short-wave or could also be UV. What is the difference between short-wave, Halogen and T3 quarts tubes? Nothing! These different names have been applied by various companies to fit the marketing strategy they use. There could be some differences in the construction of each of these quartz tubes but they all produce heat in the short-wavelength at typically around 100 Watts per lineal inch.